ELIZABETH CITY, N.C. – Chrysler just made minivans cool with the 2017 Pacifica, and it’s something you’ve never seen before! Chrysler invented the minivan, so it’s only proper that Chrysler make the minivan cool again with the 2017 Pacifica. Since the first creation of the minivan, which was 30 years ago, Chrysler has transformed the segment with 78 innovations across the first five minivan generations. With the all-new Chrysler Pacifica, there are 37 new implementations––all firsts for Fiat Chrysler Automobiles (FCA) U.S.––totaling 115 innovations made to the minivan. The 2017 Chrysler Pacifica offers bold styling, class-leading ride and handling, and unmatched fuel economy technology, including the Pacifica Hybrid option that delivers up to 80MPGe. This vehicle is exactly what families need, providing comfort, convenience, and technology. This minivan was completely re-engineered from the tires on up. It’s build like a vault so interior wind and road noise are kept to a minimum. Active Noise Cancellation (ANC) is standard on every model of the Pacifica to make long car rides, or just your daily commute, more comfortable. The Pacifica is also engineered to have the largest interior volume ever with creative storage areas and available eight-passenger seating. There are two powertrains available for the Pacifica. First is the hybrid, which will deliver 30 miles solely from electric power using a 16kWh lithium-ion battery. The second powertrain is the gasoline model, which has the award-winning 3.6L Pentastar V-6 engine producing 287 horsepower and 262 lb-ft of torque. Last, but not least, is technology. This minivan is so packed full of technology that it’s actually the most equipped vehicle of its kind. Drivers will love the Uconnect 8.4 system with an 8.4-inch touchscreen that offers navigation, integrated voice command, and Uconnect Access, which keeps them connected with helpful information like gas prices and nearby movie listings. Passengers will love the Uconnect Theater system that lets them watch movies, play built-in games, connect personal devices to surf the Internet, and stream content on the 10in touch screens. 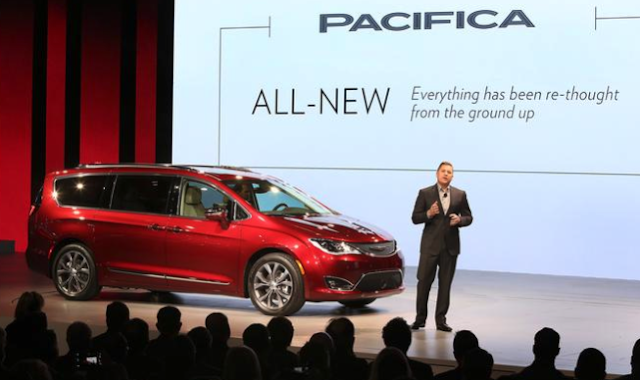 The 2017 Chrysler Pacifica will be available in six models and the Pacifica Hybrid will be available in two models. You can find the regular model in showrooms around spring of 2016, and the Hybrid models in the second half of 2016. If you’re in the market for something now, come to Perry Auto Group. We’re happy to find you a great vehicle you can take home. If you’re vehicle needs servicing this winter, we can help with that too! Our service technicians always take great care of your vehicle. Perry Auto Group has two dealership locations to serve you better at 1005 W. Ehringhaus St, Elizabeth City, NC, 27909 or 1001 Halstead Blvd Elizabeth City, NC 27909. Stop in for any of your auto or community needs, or feel free to give us a call at (252) 338-9100.